Awesome pet parents know a balcony is no place to leave a dog. But adding a few features that make a dog feel at home on a tiny terrace will make the time you spend there together better. 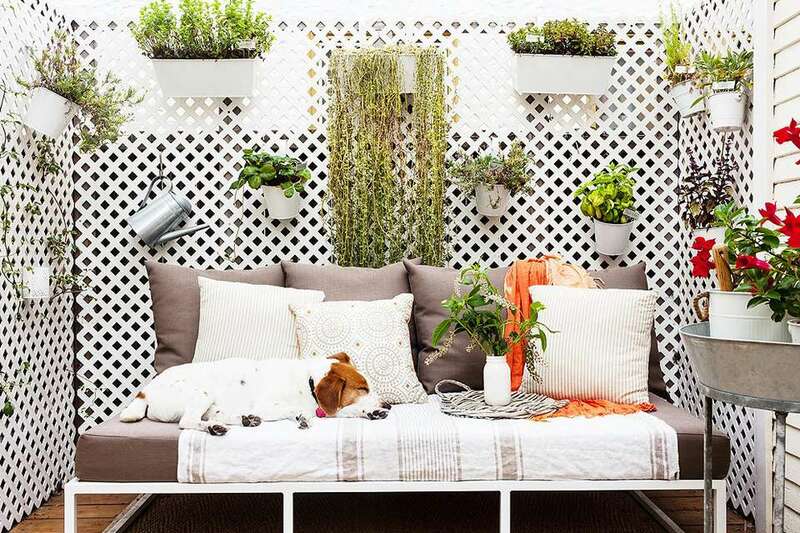 The following ten ideas will turn your apartment balcony into a canine paradise. Teaching a puppy to do its business on grass or pavement is particularly challenging when you live in a high-rise. One couple came up with a smart solution: They transformed their apartment balcony into a playground for their pup, Franklin. Along with daily walks and active play, their dog-friendly terrace took the stress and mess out of the housebreaking process. Many dogs love nibbling grass. Unfortunately, the stuff they eat in the park may be loaded with dangerous chemicals from fertilizers, herbicides, and pesticides. Also, while grass is known to be good for a dog's digestive health, it's not very nutritious. Sprouts are a healthy alternative that you can easily grow. They're chock-full of healthful and easily digestible enzymes, vitamins, and minerals. Not all plant pots are safe for storing drinking water. Look for options where you can place a "drinkable" water bowl inside as shown. Don't pick something that's too tall for your dog to use. Once you find that perfect planter, place it near a corner where it can't be easily knocked over. Rainy days happen. So first and foremost, a dog bed should have a machine washable cover made of durable waterproof fabric. Avoid stinky mildew. The bed's insert should also be weather resistant. Look for materials that won't mold or harbor bacteria if they accidentally get wet. For example, plastic fillings are more gunk-proof than natural materials like cotton. Don't forget comfort. What you pick should provide firm and even support while also being big enough for your pup to stretch out. It's a fact; stuff made for large dogs like toys, clothing, and even dog beds cost more. To keep costs down, DIY an elevated dog bed for less than $20 using PVC pipe. That's not half bad considering similar beds found online cost up to $125. While childproof balcony railings prevent kids from falling out, they don't stop small dogs from slipping through. First, drill holes for the cable ties in each of the acrylic sheets. Next, use the ties to attach the sheets to the railings. Now you'll have dog-proof railings your pup can't slip through. Just like people, dogs need protection from brutal summer heat. If your pup loves stretching out on a cool tile floor, give him a place to chill out on the balcony. Cooling mats provide hours of refreshing relief using pads or pods that you freeze overnight. Most dogs love water. This portable and foldable pool makes it super easy to create a spot where your pooch can dip his paws. To set up, close the drain plug and fill with water. When it's time to put the pool away, just empty the water and let the pool dry. Afterward, you can fold it up and put it away. You walk your dog at least three times per day. But some dogs need to go more often. When either is the case, a grass wee pad can make life more convenient when nature calls. Hydroponically-grown, dirt-free grass which absorbs urine and controls stinky odors naturally is now widely available. Even better, natural wee pads like these don't require regular maintenance because they're disposable. A dog tent that you can buy or DIY is a stylish way to keep your dog cool.